Grainger Public Relations » Dino Discoveries! Dinosaurs … they definitely did exist, but do they still? Perhaps they are not as extinct as you might think. The fascinating world of the pre-historic will be brought back to life at Dundee Science Centre this Easter. ‘Dino Discoveries’ will see a family show run from Monday 21 March through to Sunday 29 May, with visitors coming face-to-face with three dinosaurs – a Diplodocus, Yutyrannus (an ancestor of the Tyrannosaurus Rex) and Deinonychus (relative of the Velociraptor from dinosaur movie sensation ‘Jurassic Park’) in the form of weird, wonderful and wacky articulated puppets which will captivate and entertain families. Visitors can also discover some of the physical features which helped dinosaurs survive for so long, including hollow bones and feathers. By seeing that the same attributes are found in modern day birds, they will explore how birds evolved from dinosaurs. 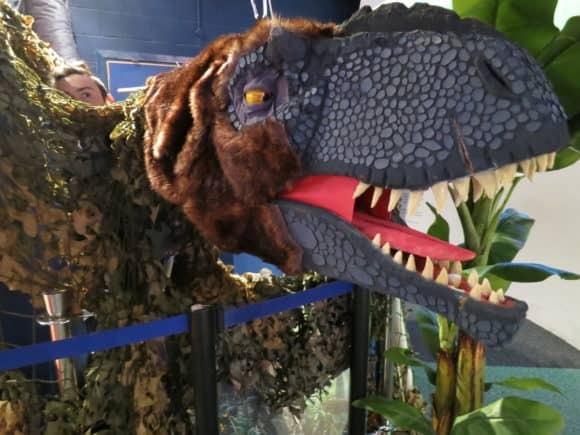 Meanwhile, to keep the younger palaeontologists entertained, the ‘Dino Tots’ dinosaur hunt will also run throughout the same dates, aimed at children aged three to five. A ‘Dig up a Dinosaur’ workshop will also run from Monday 21 March through to Sunday 22 May, with the chance to unearth some dinosaur bones and identify what’s buried in the sand. The programme of events will peak with ‘Discovering Dinosaurs’ on Saturday 9 April 2016, the latest in a series of ‘Meet the Expert’ sessions at Dundee Science Centre. Visitors can race dinosaurs and play on a supercomputer virtual palaeontology game with Alistair Grant from the University of Edinburgh. Perth-based paleo artist Jon Hoad will also be revealing some important dinosaur discoveries in Scotland and holding fun workshops where children (and older dinosaur fans!) can draw a dinosaur. The above events are all included as part of normal admission. ‘Meet the Expert’ events are planned for the second Saturday of each month throughout 2016 – please check the Dundee Science Centre website for upcoming events – www.dundeesciencecentre.org.uk. Dundee Science Centre is open daily from 10am-5pm. For further information, please telephone 01382 228800 or visit the website.